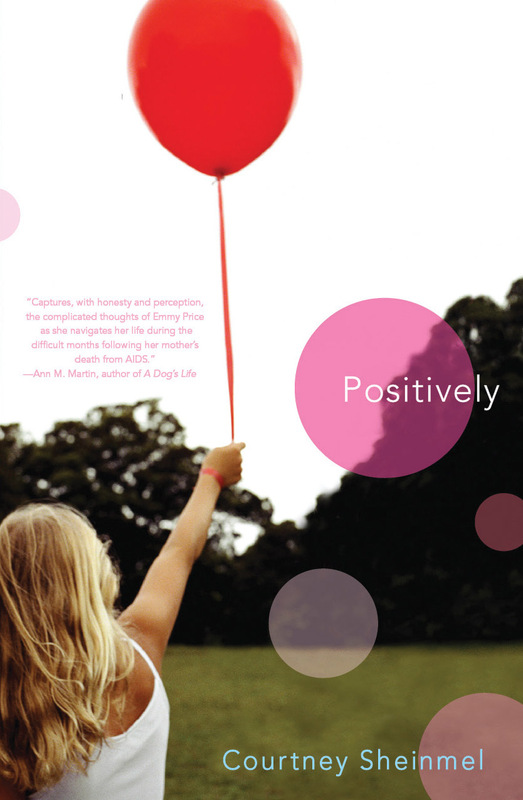 Positively was one of the five books I allowed myself to buy after coming into money last week. It’s special for that reason and (less logically) it’s one of the four books of that five that was PINK! Somehow the accidental colour scheme amuses me no end, but hey, we can’t all be sane. Since the day Emerson Price and her mother were diagnosed as HIV positive, nothing has been the same. When her mother dies of AIDS, Emmy has to go live with the father and stepmother she barely knows, and she feels more alone than ever. Now she has to take pills by herself, and there is no one left who understands what it’s like to be afraid every time she has a cold. But when her father decides to send her to Camp Positive, a camp for HIV-positive children, Emmy begins to realize that she’s not alone after all, and that sometimes, opening up to other people can make all the difference in the world. This is a tiny, very accessible book that deals with the adult issues of sexual disease, grief and acceptance in an easy manner. Think of it as Jodi Picoult for pre-teens. It’s more about Emmy’s grief over the loss of her Mother than about her life with HIV, but it still gets across how traumatising and scary the disease can be for a child. Parts of this nearly moved me to tears, as my Mum is my favourite person in the whole world and the thought of something happening to her is more than I can take. Ms Sheinmel taps into that fear most people and uses it to place you in Emmy’s shoes. Her pain is very real, very adult and very sad – it’s not softened or sugar-coated. Instead, it’s raw and brutal and I challenge you not to be shaken by it. The plot revolves around Emmy pushing her friends and family away because she feels they don’t understand what it’s like for her and she worries they only tolerate her because of her illness. Eventually she goes to Camp Positive where she befriends other children with HIV and slowly realises that life goes on, despite her loss. To be honest, I did find her a little irritating and whiny at times but then I realised how realistic it would actually be. I’ve thought things very similar on occasion regarding my own illness, and I just don’t think I’m used to having those thoughts accurately portrayed on paper. Despite that, it’s not a depressing book – a quick glance at the picture on the cover will tell you it’s more about hope than despair. I finished the book with a smile on my face and it’s sitting neatly on my shelf waiting to be read again one day when I’m feeling low. I think it could have benefited from being a little deeper and a little more HIV/AIDS-centric, but Emmy’s only thirteen and so the writing style fits her age perfectly. If Ms Sheinmel wrote a follow-up book when Emmy was a little older, I’d buy it in a heartbeat. Thanks for the review! Your comparison to Jodi Picoult makes me hesitate to read this one, because I can't stand Jodi Picoult, but I might check it out, anyway. Sanity's overrated! Pretty book spine arrangements are the bomb. Fact. I hope that one day I'm not so hopelessly emotional and will be able to read this! At the moment, I do a lot of my reading while on public transport and since blubbing in public is both embarrassing and terribly detrimental to my make-up, I'm kind of avoiding books that I know will make me cry…imagining anything happening to my Mum would definitely push this one into that category! This book definitely sounds interesting. I think it's fascinating with these kind of reads, even though the diseases are definitely awful… I do like that it's a book more of hope though. I'll definitely have to take a closer look at this one! Great, great review.